Foot Pain can be a really annoying problem. It can prevent you from wearing the shoes that you love and can really impact the quality of your life. A recent survey by the Australasian Podiatry Council found that 63% of Australians have suffered foot pain. Amazingly, over two thirds of these in the last 12 months. However, your feet do a lot of work. In the average lifetime a person will walk 128,000 kilometres, the equivalent to three times around the earth. Image what would happen to your car if you didn’t service it for that distance? Tired aching feet after activity or at the end of the day is often due to the excessive work of our muscles. Muscles can overwork because of joint displacement / misalignment and the total amount of activity that you do. Our feet function a bit like the wheels on a car. So, with poor alignment they’ll wear out quicker. As a result they will reduce the driving and performance ability of the car. If you have tired and aching feet maybe it’s time to get your wheels (feet) checked? In most cases Foot Mobilisation Therapy (FMT) and specific corrective foot exercises can put a spring back in your step again. Bunions occur when the joint of the big toe deviates from its alignment and becomes enlarged. Because the big toe is pivotal in your body’s movement a weak and unstable base will often produce a bunion and lead to excruciating pain. Exercises and Foot Mobilisation Therapy (FMT) are used to improve flexibility and strength of the big toe joint. With early treatment, surgery may be avoid and pain minimised. When the ankles excessively rolling in and the foot arch flattens the foot becomes very unstable. Due to this, other parts of the body may compensate such as your knees, hip and back. As a result the tendons and muscles can be forced to work harder. This often leads to aching and tired feet. Using Foot Mobilisation Therapy (FMT) and targeted exercises you can improve the ankle’s strength and ability to cope with the impact of daily life. When a person has flat feet, the body can experience more load and strain in muscles and joints. Having flat feet is a normal variation in the anatomy of the human foot. Flat Feet only become a problem when they create compensations that result in excessive physical load. It’s this load that can can result in pain and dysfunction. Foot Mobilisation Therapy (FMT) can be used with targeted exercises to strengthen muscles and restore the arch. Thereby improving joint alignment. In cases where the foot is excessively flexible and flat the use of shoe inserts (orthotics) may help reduce the load to foot. 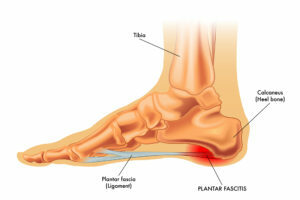 This is where the plantar fascia and heel tissues are over worked and become damaged and inflamed. This is often due to mechanical compensations in the tissues. Because the heel is responsible for absorbing so much shock, any joint displacement can impact the bones, tendons and ligaments. It’s there compensations that tend to cause pain. Over time excessive strain to the heel bone can result in a spur. A heel spur is simply the body responding to the bone stress by depositing extra bone to strengthen the area. Heel spurs are typically not painful or the cause of heel pain. They may or may not be present in cases of heel pain. Heel pain can be repaired with Foot Mobilisation Therapy (FMT) and corrective exercises. By resorting muscle function, joint range of motion and alignment soft tissue strain is reduced and healing can occur. The problem with high arches is that they reduce the ability of the feet to perform their shock absorption role. High arches typically don’t absorb the shock required for optimal foot, leg and body function. This can result in strain and pain in areas like the hips, knees and the lower back. Using exercises and manual therapy techniques, such as Foot Mobilisation Therapy (FMT), foot flexibility and shock absorption can be restored. This condition typically arises when the nerve sheath experiences abnormal levels of pressure. Consequently it becomes inflamed and thickened. Irritation can be increased by collapsing of the metatarsal arch at the ball of the foot. Most commonly the neuroma develops between the 3rd and 4th toes. Typical symptoms include an electrical pulsing feeling, burning or numbness. A Foot Mobilisation Therapy (FMT) program with targeted exercise can help restore the arch and reduce the pressure on the nerve. If you think you may have one of these problems, any other foot problem causing you grief or you are dissatisfied with your current treatment outcomes, then please contact us today.